Too much, and your photos will be washed out, too little and they'll be too dark. If you've overexposed you'll end up with blown highlights– you can never recover detail in these areas of a photograph. If you've underexposed, the same applies as with blown highlights. There's no data recorded in these areas, and you can never recover any detail. Compact digital cameras will work out the exposure for you, so you don't have to! It's still worth reading on though, as it might give you a better understanding of how your camera is working, and you never know, one day you might decide to splash out on a digital SLR! 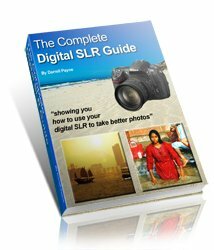 And if all this talk of properly understanding exposure completely puts you off ever getting a digital SLR, don't worry. You can always set a digital SLR to "auto", and it will handle the exposure for you; or you can come back to this page and take control of setting exposure for yourself! Understanding exposure - what affects exposure? I'm not sure where this image came from originally, but my thanks go to whoever you are! The shutter speed is a measure of how long the shutter stays open. All the time it is open, light can enter the camera and falls on the image sensor. The longer it stays open, the more light enters. If it's open for too long, the photo will be overexposed. Not open for long enough and your photo will be too dark. It's worth mentioning here that the amount of time we are talking about is usually measured in fractions of seconds. In fact, 1/30th of a second is considered slow! It's common for a digital SLR to be capable of shutter speeds in excess of 1/4000th of a second! Click for more on understanding exposure - how shutter speed affects exposure and how to use the shutter speed for creative effects.